October 27, 2017 Brian popped the question with a little help from our dog, Banks. Brian and I decided to go to Jump Off Rock located in Hendersonville, NC like we have done so many times before to catch the sunset. We usually pack a blanket, bottle of wine and my canon camera. We were walking up to the lookout spot when Brian bent down to “fix” Banks leash. I didn’t think anything of it because that dog gets tangled up all the time! To my surprise, and to say I was surprised is a total understatement, Brian did not stop there! After the engagement we headed to Asheville for a celebratory drink. Of course, I called my parents and sister immediately on the way, but little did I know, they were already in Asheville. Brian arranged for both our families to come up for the weekend to celebrate with us. Brian and I are both Appalachian State graduates, so the mountains have always held a special place in our hearts. We wanted to gather our family and close friends in the beautiful mountains of North Carolina so they could catch a glimpse into an important piece of our love story. We wanted to share with them the trails and mountains that we’ve explored during our time together. It is where we met and fell in love, so it only seemed fitting to make it the backdrop of our special day! 1. The weather on our special day completely transformed! As our wedding day was vastly approaching, I constantly checked the weather report hoping for the best and to my dismay the radar reported rain all week long. Having an outdoor ceremony, you always run the risk, but you still somehow contemplate your special day is invincible. I watched the rain fall all morning as I was getting ready. I’ll never forget the moment my mom and I were looking out the window, watching the guests arrive. I noticed the rain had stopped and the sun began to peak through. In that moment, it felt truly magical. I felt the presence of our loved ones that had passed, shining down on us, sending us their love from Heaven. To top it all off, the evening ended with the most spectacular sunset we have ever seen over the Blue Ridge Mountains. 2. My sister had the most amazing maid of honor speech! I will never be able to top her when it’s her turn to get married and I will leave it at that! 3. Writing and professing our own vows to each other in front of all of our loved ones. It was such an intimate moment that we will cherish forever. 4. The party bus on the way to the reception was wild! It was the first moment where we felt we could finally relax and that it was time to party! 5. The entire reception was simply memorable. We had THE BEST, wedding band, Cashmere! From my Uncle Pete leading the conga line to my friends yelling “encore” at the end of the night. The dancing never stopped! I will never forget the moment on the dance floor when my dad turned to me and asked “Are the cameras gone?” I responded: “Yes dad, the photographers are gone.” Next thing you know he grabs the tambourine from one of the band member and he shakes it like there is no tomorrow as a crowd gathered around and started cheering! It was just awesome seeing the most important people, from all different stages of our lives, come together and have a great time. Ross and I grew up in the same neighborhood, went to the same elementary school, middle school, and high school. However, through all that, it was vague that one another truly existed. Through mutual friends, we finally met in college. Timing is absolutely everything! Ross and I dated for a few years before he popped the question. The day he asked me to marry him was huge because that same day we finally closed on our first house together. The minute we walked inside our newly purchased home, Ross got down on one knee. That was one of our very first conversations to ever have inside our brand new home together. I was in complete shock, I had absolutely no idea it was coming and it was so amazingly special. All our friends and family did a great job keeping the proposal a secret! Deciding on a wedding location was one of the easiest decisions! Ross and I knew immediately that we wanted to have a destination wedding but not too far from home, so our grandparents could attend. Having an indoor ceremony with spectacular views was at the top of our list and Asheville seemed like the perfect place! 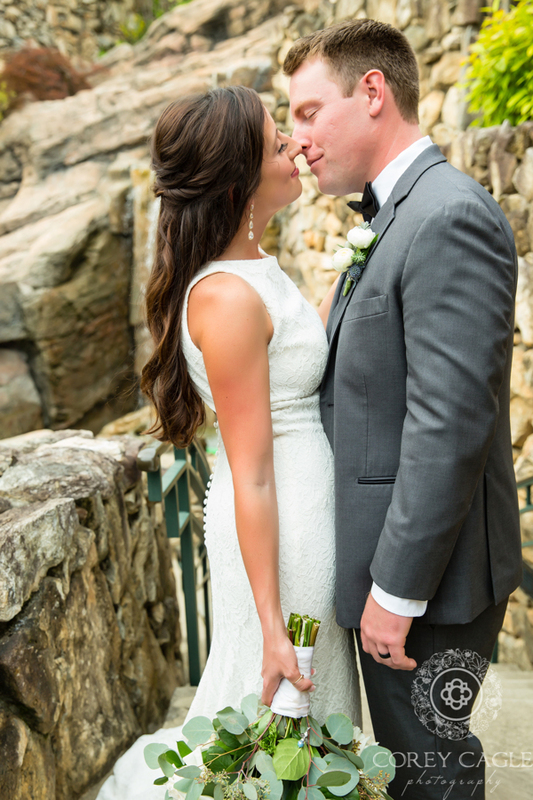 After a few venue tours, the Omni Grove Park Inn won our hearts. Picking only 5 favorite moments is next to impossible because the day was unquestionably perfect, thanks to Mary Bell and her amazing team! 2. As a special twist, we decided to have a painter at our ceremony, Brittany Rawls. The painting Brittany did is breathtaking. 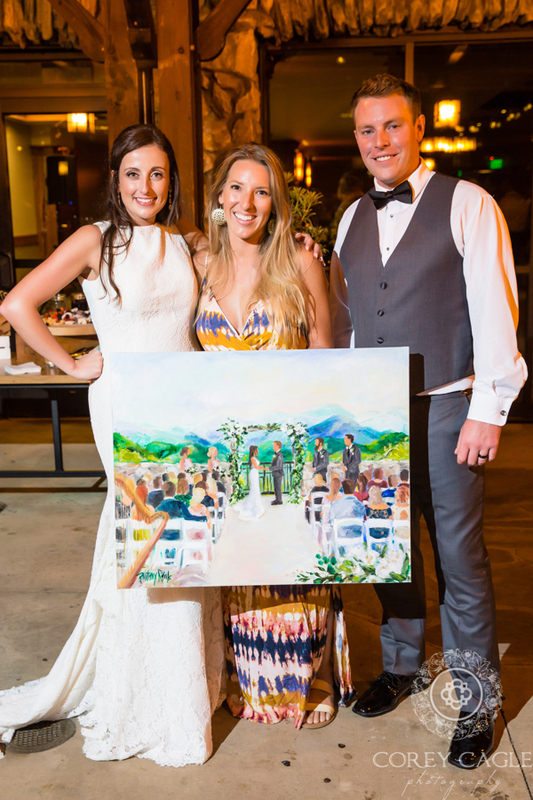 Having the painting is a constant reminder of how incredible our wedding day was. 3. Our first dance together as husband and wife was to the song “This Is It” by Scotty McCreery. What topped it off was having our ceremony musician, Brandon Crocker perform it live. Wow, he was great! 4. Let’s not forget about the food and cake! It couldn’t have been better! Daniel and I became engaged July 17, 2017 at Lake Lure just outside of Asheville, NC where we were taking a summer holiday. Daniel proposed on this beautiful flowering bridge overlooking the lake. To our surprise, my mom and dad flew into Asheville to congratulate us on our engagement! Daniel and I drove from Lake Lure to the Inn on Biltmore estate to meet up with my parents and it was such an unexpected treat to be able to share such a milestone in my life with my dear loved ones. As we were all enjoying a glass of wine on the veranda, a comment was made about what a beautiful location for a wedding it would be. My father was always so adamant that we get married in Oklahoma, but to my dismay- he agreed! As a more perfect spot could not be replicated anywhere else. My father was always so proud of what a gentleman Daniel’s parents raised and was pretty impressed when Daniel drove all the way from Charleston, SC to Raleigh, NC simply for a lunch meeting and to ask for my hand in marriage! 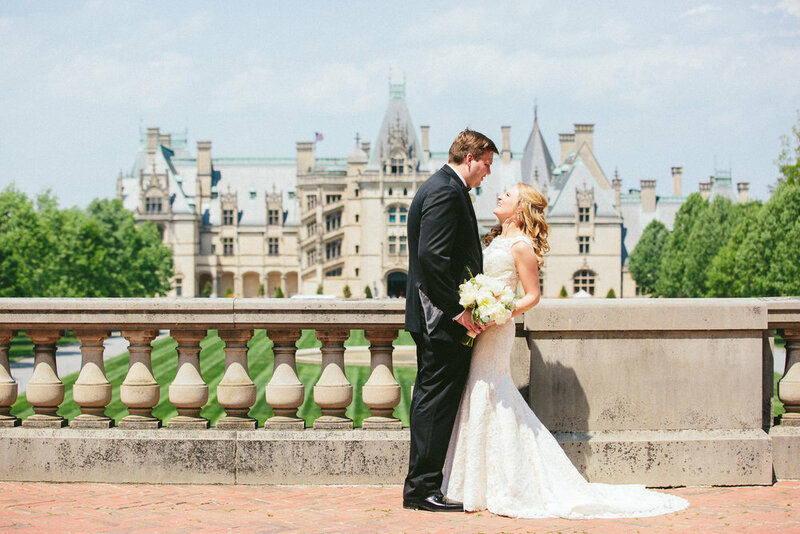 1 Of course the “First Look” is always magical, especially overlooking the vista at the Inn on Biltmore Estate. Ultimately, my favorite was when I was walking down the aisle and seeing Daniel choke up. 2 When it was discovered at the Inn, that the groomsmen could see the bride from their first floor patio into the bride’s third story window! My soon to be mother in law started playing charades with the boys from the window trying to get them to scurry. It was hilarious! 3 During the ceremony, Daniel interrupted the officiant several times, jumping the gun and shouted: “I DO” before the officiant was even ready! He was so excited! 4 Daniel loved stomping on the chuppah. To his dismay- that was the last time he ever gets to put his foot down! 5 As soon as it was time for the garter toss my brother went running! *Bonus: Mary Bell stole bean bags from a completely oblivious couple playing corn-hole and making a racket during the ceremony. Mary was amazing and we couldn’t have asked for a better companion for our special day. Caleb and I met through mutual friends during sophomore year at Wake Forest University. I had spent so much time studying for exams with friends in Caleb’s suite and he was never even there. As Caleb was preparing for medical school, his time was dedicated to the library. As fate took its own course, a few semesters later, I had finally met the mystery man. After sophomore year, Caleb explained he was going abroad to Vienna. I imagined the friendship we had built together would simply diminish, he wasn’t even taking a cell phone! Once Caleb arrived, he discovered Europe had technological advances after all and we kept in contact almost daily. We realized that our families, Christina religion, and passion for pre-medicine were all aspects we loved to talk about. January of 2016, I was incredibly stressed and beyond ready to graduate. Caleb had come into town and we planned to meet after an excruciating three hour microbiology lecture. Thru persuasion and deal making, Caleb and I decided to go for a glass of wine at a winery close by. One glass in, Caleb kept pushing that we go upstairs to enjoy the deck overlooking the Shenandoah Valley. It was a perfect Thursday! The sun was setting, the winery décor was gorgeous, candles were lit and dispersed, and I thought how odd for a Thursday! As the décor wasn’t odd enough for a random day out of the week, Caleb kept being so weird! Then it finally clicked, I knew what he was doing and I was shocked! He proposed! Then I immediately had to make sure he asked for my father’s blessing and it turned into a weekend full of graduation and engagement celebrations with friends and family. 1 During my dad’s toast he couldn’t help but point out that Caleb and I are both graduates of Wake Forest. As undergrad tradition calls, large trees lining our main quad are always TP’d after big sports success. My dad decided to have Caleb and I TP’d by some of our guests at the wedding and we thought it was so creative and funny! 2 Singing Braun German Songs! My extended family knows a set of German songs by heart that we sing at every family function. At the end of the wedding, everyone gathered together and we all sang versions that were printed out for guests to join in on. Puts a smile on my face just thinking about it! 3 Caleb and I both love kids and we couldn’t imagine our wedding without them all together! Caleb has a little brother who is fourteen years younger and our nephew which was under a year old also attended. Some of my fondest memories were all the kids’ sitting together. Their faces were priceless as they were observing all the different dance moves! 4 My siblings and I have this tradition that we started many years ago, where the four of us gather for a picture as we are tightly hugging. We have now been practicing it over and over throughout all life achievements and events. My siblings play the role of my best friends so being able to create another picture on my special day was unforgettable. 5 Our first dance. Before Caleb and I were even engaged we already had our song picked out! As we are both huge country music fans- dancing to “Mean to Me,” by Brett Eldridge was everything we both had dreamed of. We are a destination wedding and event design company located in Asheville, North Carolina but available for travel. 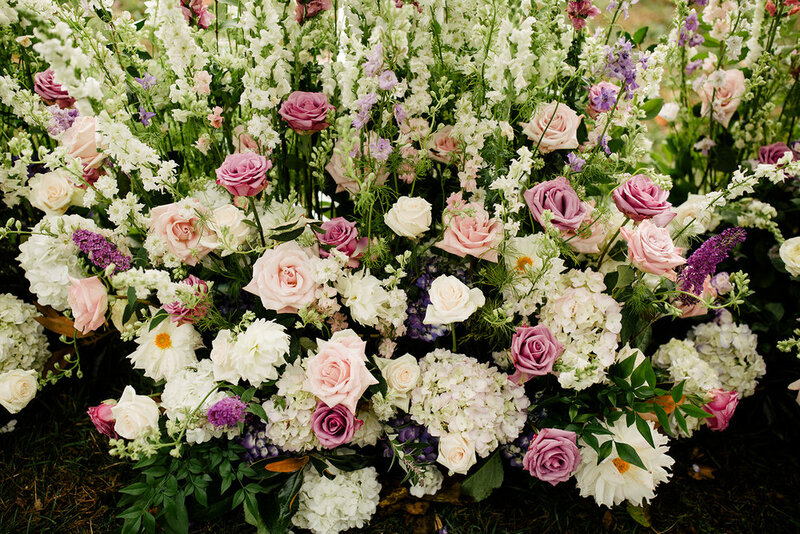 From the flowers to the favors, we strive to bring an extra dose of flair, elegance, sophistication to each event we touch--from an intimate dinner party to a wedding for 300. Your event will be unique to you and always beautiful.